Snap is far outperforming the NasdaqWednesday. Tech stocks are flat to down, after news of a Facebook data breach sparked a rough two days for the entire market. Watch Snap stock move in real time here. 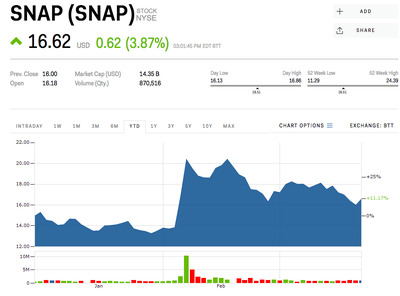 Snap shares are up almost 4% Wednesday, to a high of almost $US17 apiece. Many of the large tech stocks are flat or down in contrast, after a Facebook data breach revealed over the weekend scared investors. Snap, like Facebook, has received negative attention regarding its platform recently, after several incidents including an ad the company removed because it may have offended some domestic violence victims. But while Snap’s stock’s having a good day, the Nasdaq is wavering between just above its open and just below it. Alphabet is slightly off, down roughly .1%. Netflix is down almost .5%. Apple is down almost 2%. Amazon is down almost 1%. Facebook is up slightlty, just below 1%, after the stock endured its worst two day stretch in over five years, losing $US50 billion in market cap in that span. The selloff resulted from news that a political research firm, Cambridge Analytica, had illegitimately accessed 50 million user accounts. Snap stock is up more than 10% year-to-date.